Extra Heavy Duty Cable Ties | 175 lb. Nylon Zip Ties | Cal Fasteners, Inc.
For extra heavy duty applications, Cal Fasteners carries extra heavy duty cable ties with 175-pound capacity. Various lengths are available to meet your needs. These zip ties are available in natural nylon, gray nylon, and UV-treated black nylon. 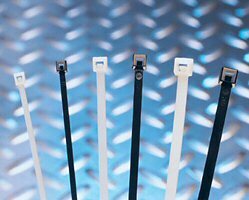 High quality materials and various unique features give these extra heavy duty nylon cable ties exceptional durability and ease of use. One-piece construction and advanced pawl and teeth designs provide high tensile strength, while finger grips and tapered tails make handling, alignment, and tightening easier. Low insertion and pull through force allow for easy installation. ROHS compliant. Request a quote on extra heavy duty zip ties for your application, or contact Cal Fasteners to learn more.